March 31 – April 2, 2016 | The Fredericton Playhouse (Fredericton) Theatre New Brunswick concludes its professional season. Theatre New Brunswick Announces Puppetry Workshop With Internationally Celebrated Puppeteer. 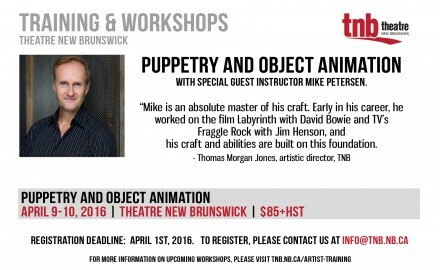 PUPPETRY AND OBJECT ANIMATION April 9 – 10, 2016 | Fredericton, New Brunswick | TNB Rehearsal Hall |.